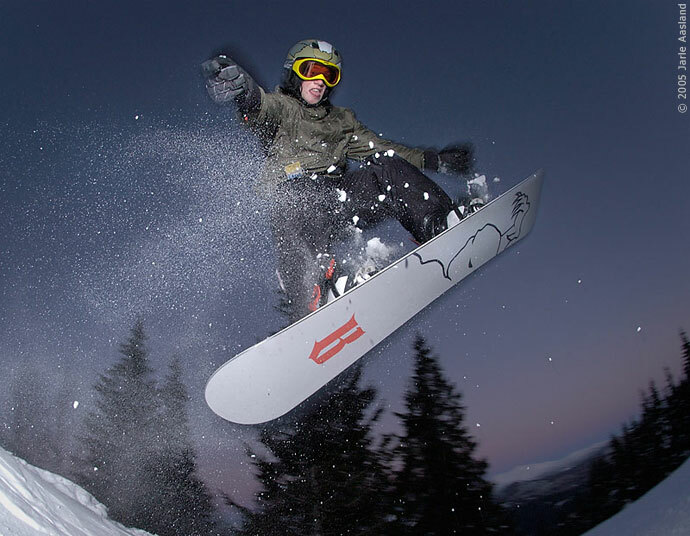 Fisheyes are some of the most fun, most extreme and most challenging lenses you can work with. They can produce spectacular photos, and they can produce junk. In that respect, they're like other lenses, only more extreme. I won't say much about the optical characteristics of these lenses. 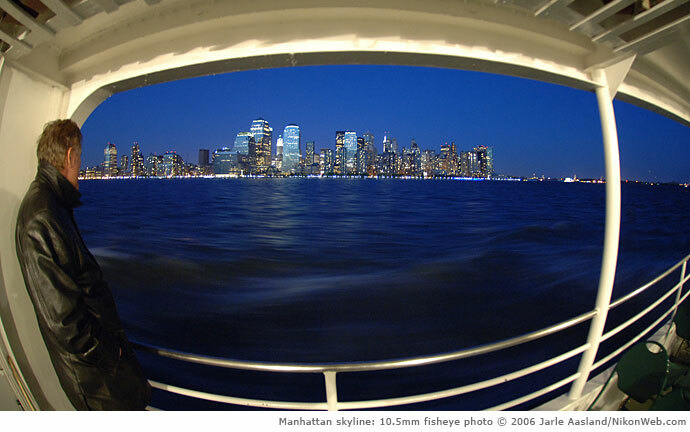 Reading this, you probably already know what a fisheye lens is, but here are a few quick facts: Fisheye lenses come in two flavours: Full frame and circular. Nikon pioneered the development of such lenses, releasing the World's first normal production fisheye lens (Nikkor 8mm f/8) for 35mm photography in 1962. Fisheye lenses were first developed for scientific purposes, but soon found their way into "normal use" (whatever that is). 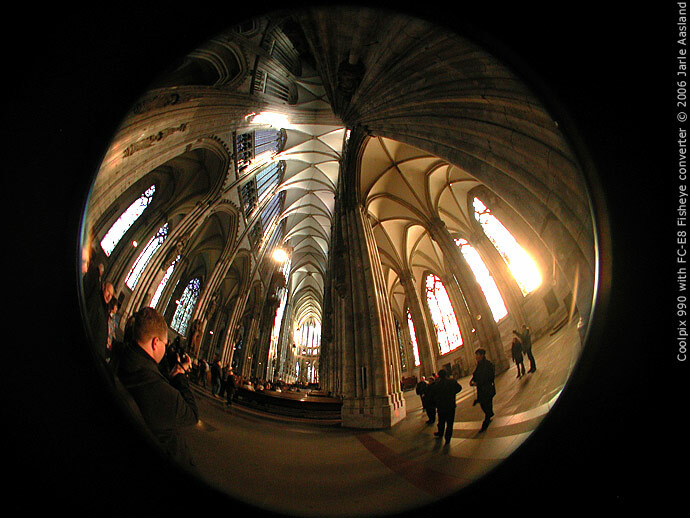 I've used fisheye lenses before, but never owned one until I found a relatively cheap FC-E8 fisheye converter for my Coolpix 990 on a trip to Cologne, Germany, in 2001. These days you can buy these things on eBay for less than $100. 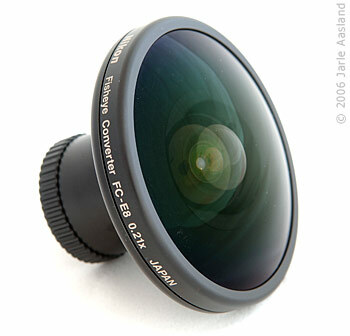 Unlike ordinary SLR fisheye lenses, the converter can produce both full frame and circular images, depending on camera settings. 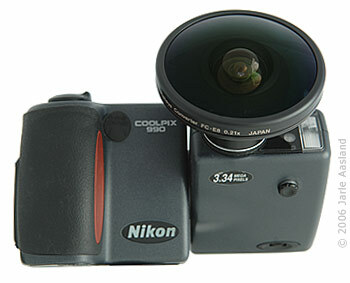 The converter is simply screwed onto the existing, fixed lens of the Coolpix, and the fisheye settings in the camera menu will zoom the camera's lens to produce different views (circular of full frame). 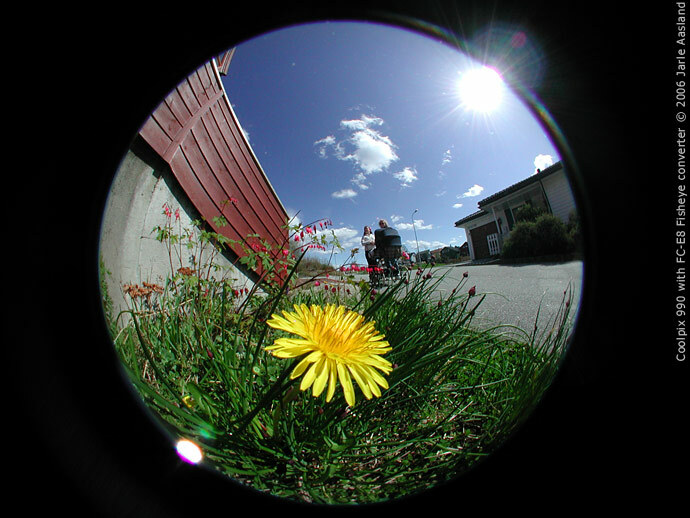 The Coolpix fisheye converter is probably the easiest, and certainly the cheapest way to get circular fisheye photos from a digital camera these days. 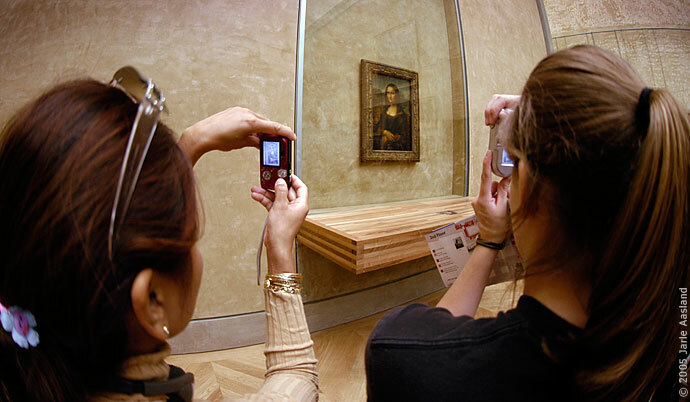 It's one of the main reasons my old Coolpix is still being used (although not as often as it used to). Optical quality is good, but obviously not perfect. Considering everything, I think the converter is well worth its price. 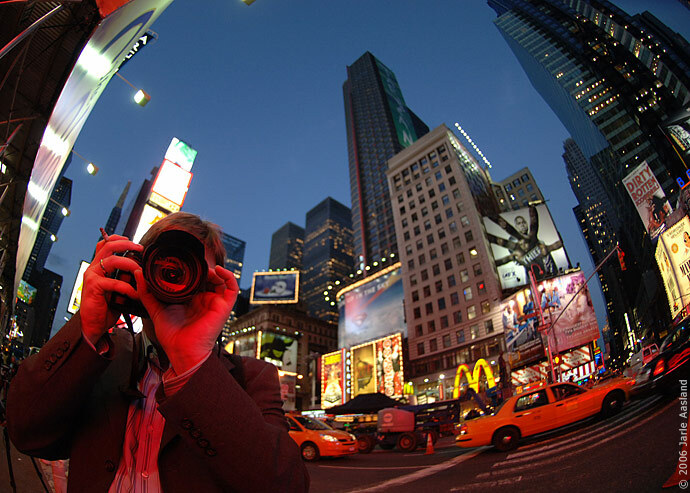 Alternatively, you'll need to get a full frame DSLR (a Nikon D3s or a Nikon D700, for example) and a «real» fisheye lens (one of the cheapest being Sigma's 8mm at almost $900). You can also make circular fisheye lenses work with DX-sized Nikon sensors (those with a 1.5x crop factor), but it's not for everyone, as you can see here (external link will open in new window). 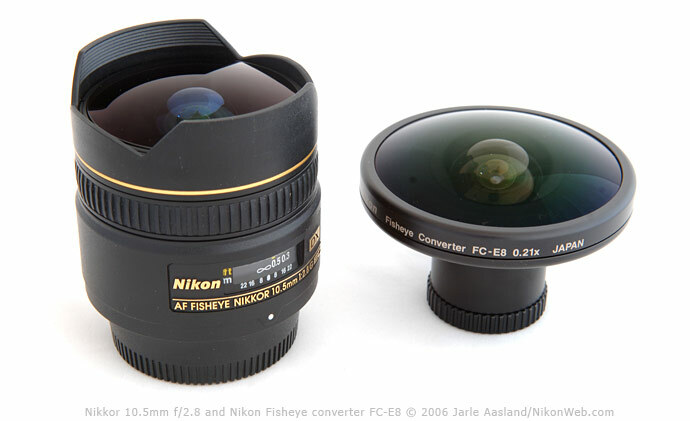 A circular fisheye lens is the only thing missing in Nikon's current digital lineup (September 2006), and I guess that can be used as an argument for Nikon to develop a full frame DSLR (which I'm convinced they already are, but that's another discussion). Update: Nikon released their first full frame DSLR (Nikon D3) in August 2007, but at this time (November 2009) they do not offer a full frame fisheye lens. When Nikon announced their new, digital 10.5mm fisheye lens in July 2003, I instantly knew I had to get one. And so I did. Shooting digital, it's both easier, cheaper and more fun to experiment, so a fisheye lens is probably a better investment today than it was in the old film days. Still, you should realize that fisheye lenses have limited use, once the novelty effect wears off (there's a limit how many funny, long-nosed portraits you can take). You should probably only get one if you have all the other equipment you need, or if you know what you are doing. 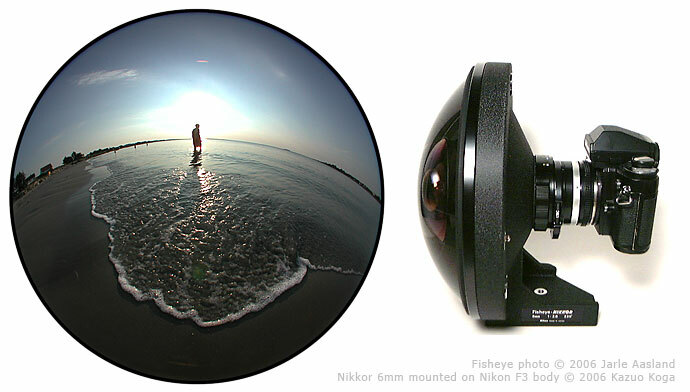 I'm a big fisheye fan, and I'm very happy with the 10.5mm f/2.8G ED AF DX Fisheye-Nikkor (whew!). Again, it's not optically perfect, but still very, very good. I really couldn't care less if corner sharpness isn't perfect or if you see some purple fringing while staring at your monitor at 100%. This lens will capture images like no other tool in your arsenal. For obvious reasons, the 10.5mm is much better than the FC-E8 converter (which is, after all, only attached to the small, existing Coolpix lens). For full frame digital fisheye photos, the Nikkor 10.5mm mounted on a 1.5x crop factor DSLR camera is the obvious choice. For a full frame camera (like D3s or D700), get the 16mm instead. Using Nikon Capture you can even modify («defish») the 10.5mm shots to make them appear to have been taken with an ordinary, rectilinear wide-angle lens (an operation often referred to as rectilinear correction). In addition to the normal fisheye correction, I've also checked the «Include areas where there's no image data» option. This will produce a wider, panorama-like image, but it will also include some extra empty space on top and bottom of the image, as seen in the final step above. The black void was later cropped away, producing the final super-wide image. 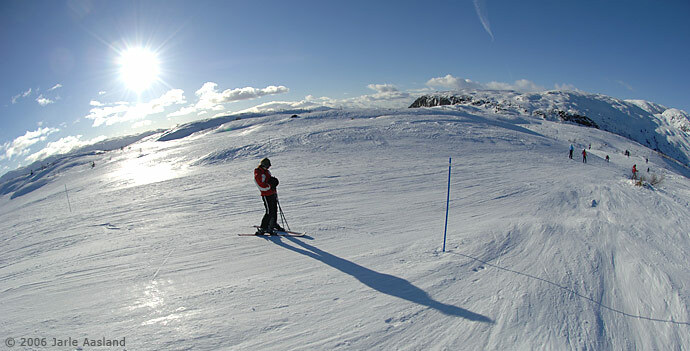 Sometimes, the fisheye-to-rectilinear option can be very useful, often it's not. If you don't want the curved fisheye effect, one could argue that you probably shouldn't use a fisheye lens in the first place. There are plenty of wide alternatives, including Nikon's own 12-24mm or the less expensive Sigma 10-20mm lenses (for DX bodies). 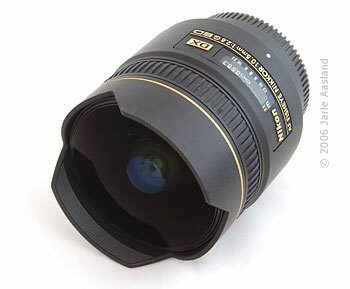 If you want the best extreme wide angle lens for a full frame body you can buy the impressive Nikkor 12-24mm f/2.8. Often, I'm not convinced if the corrected version is better than the original, but it's nice to have the option available. In the end, it's just a matter of taste. 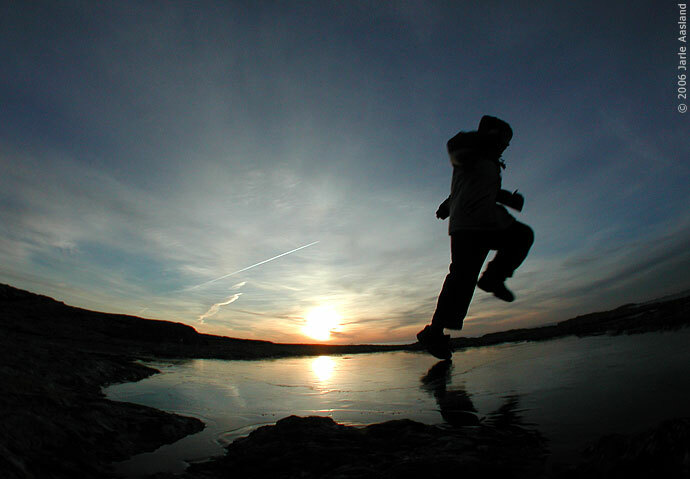 (� 2006 Jarle Aasland. Please do not distribute or use any photos on this site without prior permission). This article was written and first published in September 2006.